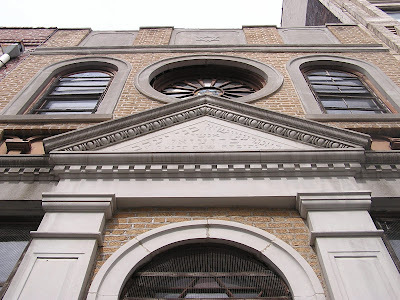 I was surprised to realize this spring, while teaching a seminar on synagogue architecture and historic preservation at Cornell University, that I have never devoted a blogpost to the history, architecture, and ongoing preservation efforts at the New York's Congregation Bnai Jacob Anshe Brzezan ("Sons of Jacob, People of Brzezan"), better known as the Stanton Street Shul. It was surprising and a little embarrassing since it was Jonathan Boyarin, Mann Professor of Jewish Studies at Cornell and author of Mornings at the Stanton Street Shul who invited me to teach the course, and Jonathan's wife, Dr. Elissa Sampson, who has championed the preservation of the synagogue and in the past has made me welcome there. NY, NY. Stanton Street Shul. entrance vestibule.. Photo: Samuel Gruber (2017). NY, NY. Stanton Street Shul. sanctuary, vw. from entrance to Ark.. Photo: Samuel Gruber (2017) . NY, NY. Stanton Street Shul, Aron-ha-kodesh (Ark). Note Holy Land murals on either side.Photo: Samuel Gruber (2017). NY, NY. Stanton Street Shul, Detail of wall painting of zodiac sign for month of Sivan (Gemini). Photo: Samuel Gruber (2017). The Stanton Street Shul, which is tiny in comparison to Beth HaMedrash HaGadol, is one of the few intact tenement synagogues of the Lower East Side. Despite vastly changed demographics in the area, it has managed to continue as a functioning house of worship with a congregation embracing continuity of the older immigrant population while also welcoming younger singles and couples just starting families. While most synagogues in the area have been destroyed or entirely transformed for new residential or commercial use, the Stanton Street Shul still conveys in its constricted space the real feel of a special kind of Jewish worship space of decades past. It is also important for its painted mazoles or mazolot (zodiac signs), probably painting in the early 1930s, which decorate its walls (read more about the mazoles here). NY, NY. Stanton Street Shul, interior looking from Ark to entrance. Note placement of mazoles decoration on side walls. Photo: Samuel Gruber (2017). NY, NY. Stanton Street Shul, women's gallery looking toward entrance wall. The front rose window was restored in 2012.. Photo: Samuel Gruber (2017). NY, NY. Stanton Street Shul, Inside the sanctuary entrance, beneath the women's gallery. Note the tin ceiling and the remarkable florescent chandelier in memory of Max Roth (one of several). The front rose window was recently repaired. Photo: Samuel Gruber (2017). The shul’s size, configuration, and decorations are survivors and now surrogates for all the similar shuls that are long gone; either demolished or transformed into commercial or residential space. A visitor to the Lower East Side needs to experience both the grandeur of the restored Eldridge Street Synagogue and the simple warmth of the Stanton Street Shul to begin to understand the diversity of religious expression of Eastern European Jewish immigrants. Both the now-destroyed Beth HaMedrash HaGadol and the well-preserved Bialystoker Synagogue were created out of former churches. But Congregation Bnai Jacob Anshe Brzezan was created in 1913 by architect Louis Sheinart on a tiny, 99.5’x20’ lot that had pre-existing front and back buildings whose remains were incorporated into the new Shul. The greatest structural damage appears to be in these older walls. Despite its Renaissance-inspired façade, the building is humble throughout. When I lived in New York from the late 1970s through the early 1990s there were still other examples of "tenement shuls" such as Adas Yisroel Anshe Mezeritch. Today, however, other than Stanton Street, one can only visit (and attend services at) the beautifully restored Kehila Kedosha Janina, the tenement synagogue of New York's Greek Romaniote community on Broome Street. There are a few other restored and/or active synagogues in the area, but none of them take us to the tenement and landsmanshaft story of Eastern European immigrant Jews the way the Stanton Street Shul does. Today, it is imperative that this space and its decorations be preserved in way that is both historically accurate and Jewishly functional. The Stanton Street Shul is well documented. It has a good wikipedia page, and also it has been listed on the National Register of Historic Places since 2002 with a nomination form (full pdf here) written by Anthony Robbins, who knows his stuff. The nomination came after the shul was almost demolished when, in 1999, the rabbi tried to sell the building against the wishes of the small congregation. A resulting lawsuit was settled in 2000 in favor of the congregation, and this led to the revived commitment to the synagogue as both a living congregation and an historic building. NY, NY. Stanton Street Shul, Damage to interior wall surface (this is the worst instance). There can be many reasons for the deterioration of wall finishes, but the most likely in this case is water penetration from the walls. Photo: Samuel Gruber (2017). NY, NY. Stanton Street Shul, Damage to ceiling. Earlier repairs have stopped most of the water penetration from the roof, gutter and other exterior points of entry, but the interior damage seen here on the original tin ceiling, still needs repair. Unfortunately, there are probably also within the walls untraced corroded iron pipes and channels for wiring that now serve as conduits for damp. The hole is because a section was removed to insert a probe. Photo: Samuel Gruber (2017). After the NR designation, the congregation mounted a successful fund-raising campaign in 2005 that enabled a complete roof replacement and other repairs. The small congregation has been dedicated to this mission for more than a decade. The building was already in disrepair when it suffered ­­serious water damage from Hurricane Sandy in 2012. The NY Landmarks Conservancy provided a $30,000 matching grant which is allowing some urgent repairs to take place this summer, but the under and overlying problems are more severe and need substantially more funds. Since 2000 maintenance, conservation, restoration, and remodeling have taken place in fits and spurts as needs required and funds were available. An intensive examination of the plaster and paint of the sanctuary walls - specially the condition of the painted mazoles - was carried out by Beth Edelstein, Sarah Barack, and Rosemarijn Keppler in 2009-11 The full report - essential background for anyone dealing with the reservation of wall paintings - can be be found online here. This resulted is the complete conservation of one of the wall panels as a test and as an example - but funds have not been raised to carry out the rest of this work. Meanwhile, greater underlying structural and moisture problems in the walls have further endangered the test mural conservation. As a practical matter, all of the murals are decaying extremely rapidly and decisions need to be made as to what to do. At present, the Holy Land scenes of The Tower of David (Migdal David) and Rachel's tomb (Kever Rachel) which flank the Ark appear to be in stable condition, but many of the painted mazoles are deteriorating. These murals are rare in their extensive presentation and probably unique in New York in their survival. They rank among the most intact and representative examples of the Jewish traditional painted art in New York, and in the world. They are part of a nearly-vanished tradition still evident at the Vilna Shul in Boston and the "Lost Shul Mural" in Burlington, Vermont, both places where the value of the murals have been recognized and where extensive conservation and rescue work has been undertaken. Previous New York examples have either been destroyed or “restored” by overpainting (as at Linath Hazedeck in Brooklyn), and even substantial reinvention by mixing old and new designs (as at the Bialystoker Synagogue in Manhattan). NY, NY. Stanton Street Shul. Migdal David mural to left of Ark. Photo: Samuel Gruber 2017. NY, NY. Stanton Street Shul. Kever Rachel mural to left of Ark. Photo: Samuel Gruber 2017. These synagogue paintings and many others now lost comprise one leg of the table of Jewish immigrant folk art. As Murray Zimiles showed in his Gilded Lions and Jeweled Horses, From the Synagogue to the Carousel 2007-08 exhibition at the American Folk Art Museum, wood carvers and carpenters made fancy and often exuberant arks and other wood items, best known through many carved lions and eagles in synagogues, as well as festive (and secular) carousel animals. Textile artists embroidered Torah covers, Ark curtains, coverings for the synagogue reader’s table, and other cloth items. Paper artists made paper-cuts for home and synagogue, and decorated certificates, calendars, and other items, Lastly - but importantly - painters decorated synagogue walls and ceilings with symbolic and landscape scenes, including mazoles and scenes of the Holy Land as at Stanton Street Shul. But these - because they are attached to synagogue walls - have not generally been represented in museum exhibition of Jewish art. Almost too late, the small number of surviving works is now being documented studied and – when possible – conserved. They are direct connections with the immigrant artists whose hands made these works, and by extension, they help link American synagogue art to much older decorative tradition that once thrived in Eastern Europe but is now mostly lost [for lectures by me from 2013 on this subject click here]. Congregations in Toronto and Montreal, Canada; and in Burlington, Vermont have made or are making heroic (and often expensive) efforts to conserve and preserve wall paintings that are part of the same "family" of tradition Jewish religious art. It is important that New Yorkers undertake a similar effort to save those at Stanton Street Shul. The major technical obstacle to the preservation of the wall painting is that they are applied to plaster that apparently sits directly on the brick structure walls that needs work within. Structural integrity and mechanical systems all need to be tested and upgraded and it is difficult - and might be impossible - to do this without affecting the murals. Ideally this should precede the conservation and restoration of all interior finishes, but the murals would have to be consolidated and secured before this work begins. How this can be done is under discussion now. In 2012, the facade rose window was restored by a glass preservation team of Larry Gordon and Reuben Bechtold who reused as much of the old glass as possible. The frame was redone out of old cypress and restorers were able to reuse a good deal of the old glass. did the work. Also in 2012, a complete historic structures report and preservation plan was prepared for the building. To do everything that is needed it is estimated at least $3.5 million dollars will be needed. This will require a big congregational commitment and creative fund raising to establish some public-private partnerships. It can be done - Kehila Kedosha Janina on Broome Street is proof of what is possible. This summer a new restoration effort in getting started. It will be hard work. But it begins. The congregation recently approved a plan to move ahead with approximately $200,000 in essential repairs. NY, NY. Stanton Street Shul. Zodiac sign (Pisces / Dagim) for month of Adar Detail of Photo: Samuel Gruber (2017). ... The stone and brick structure is wedged into a tiny, narrow lot—only twenty feet wide and roughly 100 feet long. A three-story building, the synagogue houses the beis midrash (house of study) in the basement, where members daven during the week in daily prayer. It includes a raised reader’s platform, and a built-in ark for the torah scrolls at the north end. Rising above the room on either side are galleries for the women’s section, and a pressed-metal ceiling with two octagonal skylight domes. A series of 12 wall paintings of the months, with zodiac signs – said to be unique to the Lower East Side – date back at least to 1939. In 1952, Anshei Brzezan merged with the joint congregation Bnai Joseph Dugel Macheneh Ephraim which represented two other towns from Poland, Rymanow and Bluzhower, a common practice at a time when the Jewish LES was shrinking so rapidly. Many of the shuls were also being displaced by the urban renewal projects taking place in lower Manhattan in the late 50s. The Stanton Street Shul, located in a Latino part of the Lower East Side, was one of only a few that survived. The survival of this small shul (one of approximately a dozen functioning synagogues in the neighborhood today) is not only a testament to the perseverance of its elderly, immigrant members, for whom it is a true home and living memorial to otherwise forgotten towns. It is also a symbol of the renewal of the Lower East Side as a neighborhood where younger Jews with their own traditions are now moving in and forming connections, reweaving the chain of generations so nearly unraveled in the turmoil of the twentieth century.